I've seen this tag doing the rounds over on YouTube at the moment and I really wanted to join in! As you can imagine, we've spent the past few months looking at lists and lists of baby names, as we are expecting our second baby girl later this year! Her first name was pretty much decided from day one, however I thought I would share some of the other names that were on our list. You may notice that these are quite popular names, but this personally doesn't put us off choosing a name if we really like it. Olivia - I think it is such a pretty name and would go well with our other daughter, Sophie. Charlotte - To be honest I didn't used to love the name Charlotte, but it's definitely grown on me over the past year or two! Harper - Admittedly, this name isn't something I would usually choose but for some reason I absolutely love it. I think it's beautiful, unfortunately Toby doesn't agree but I just had to include it in this list. Elsie - I believe older names are making a comeback and I just think this is really cute and would suit any age. Rose - I really like the name and it works perfectly as a middle name, however Toby isn't a huge fan of flower names so I'm not sure we would use this. Ellie - Believe it or not, Sophie was actually almost called Ellie but I wasn't keen on Eleanor, which is what it is usually shortened from. I think it's a lovely name on its own though. Lily - I love the name Lily and I think it's so pretty! Daisy - This is such a beautiful name and it would be perfect for a Spring or Summer baby! Isabelle - I think this is such a beautiful name. Grace - This was our second choice of middle name for our baby girl, but we have finally decided on a different one now. Although it is lovely as a first name too. 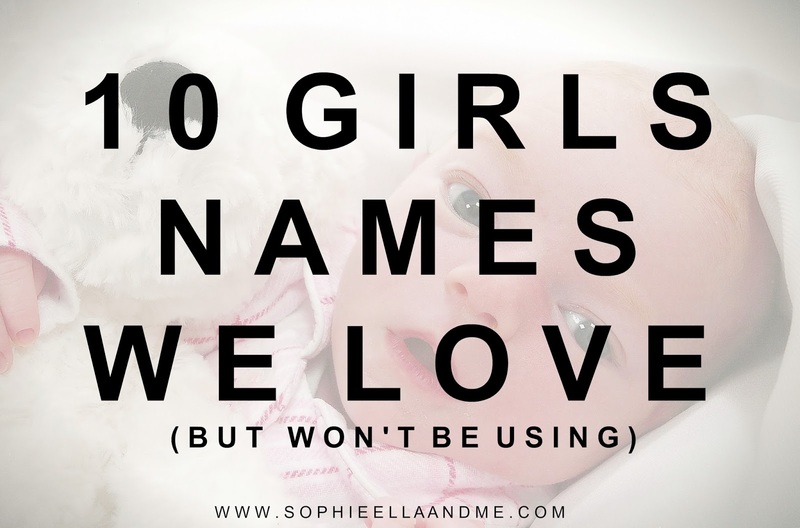 So there you have my top 10 baby girls names! And who knows, if we have a third baby girl in the future, we may use one or two of the names above!